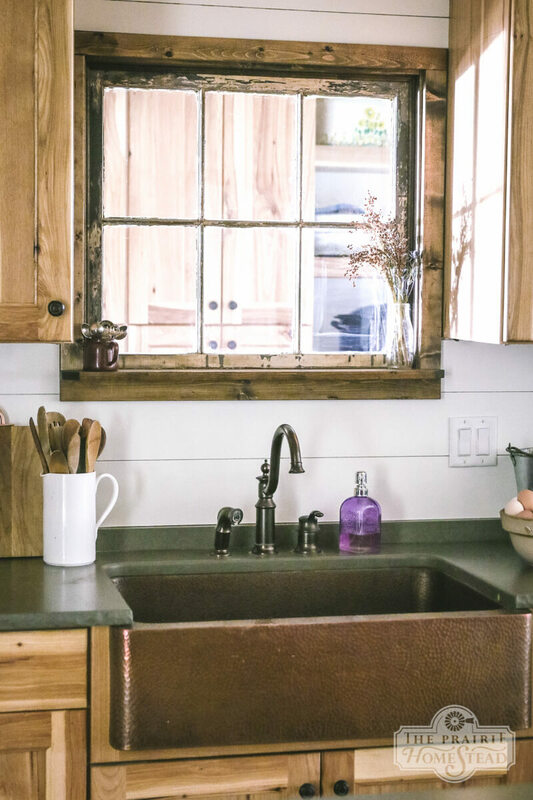 There are endless options to create the right farmhouse kitchen for your family. 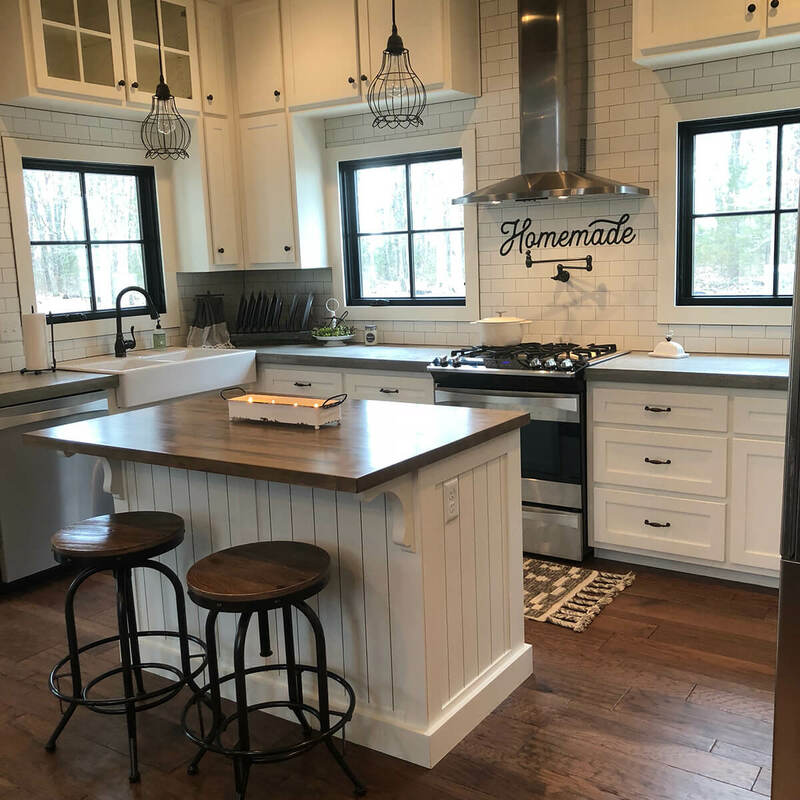 Most people think their only option when looking at kitchen backsplashes for their farmhouse kitchen is shiplap. While shiplap is a great option, there are many other viable options to investigate. 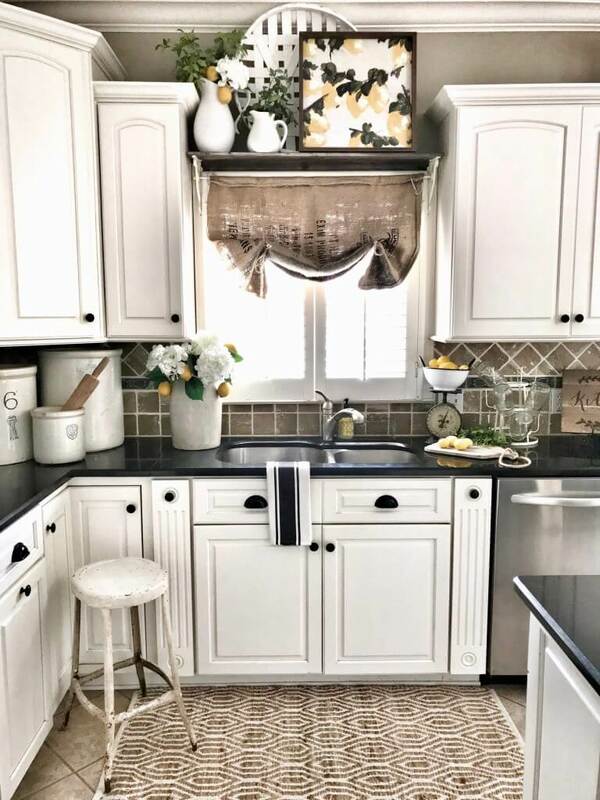 These eight farmhouse kitchen backsplash ideas can serve as inspiration when creating your dream farmhouse kitchen. Little design elements add to the appeal of the kitchen and create a welcoming appeal, such as the butcher block counter-tops and lavender garland draped from the window. The interesting element in this backsplash is the choice of a wooden look, instead of a traditional tile. The dramatic appeal of the copper sink immediately draws you in as you look at this kitchen. 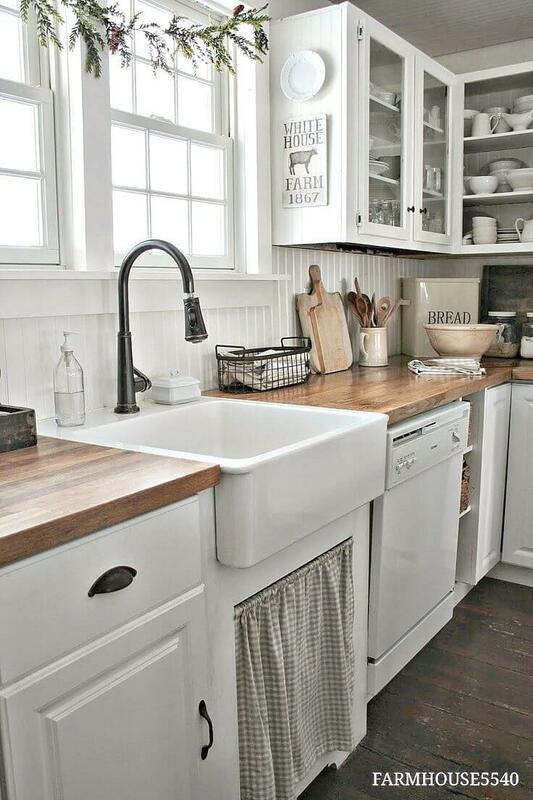 The design maintains the farmhouse theme with simple, white cabinetry and dark hardware. However, the designer added an element of surprise with the combination of a hammered copper sink and an exposed brick backsplash. Versatile white subway tiles have become a mainstay in kitchen backsplash design. This kitchen has more traditional details, such as the applique below the stove and tan granite counter-tops. Where the farmhouse design is brought in are in the small details, such as the exposed pitchers, plates, and the cute, distressed wooden sign. Pops of color are brought in through the clear, glass jars and bright green granny smith apples on the counter. Using a stencil for a backsplash is an easy way to make your kitchen 100% unique. You can choose favorite lyrics, a poem, or something uniquely meaningful to your family to use as your stencil. This kitchen draws in other farmhouse inspiration from the hanging pine wreaths to the copper mule mugs on the counter-top. This is a totally unique item to add to your farmhouse kitchen backsplash ideas list! 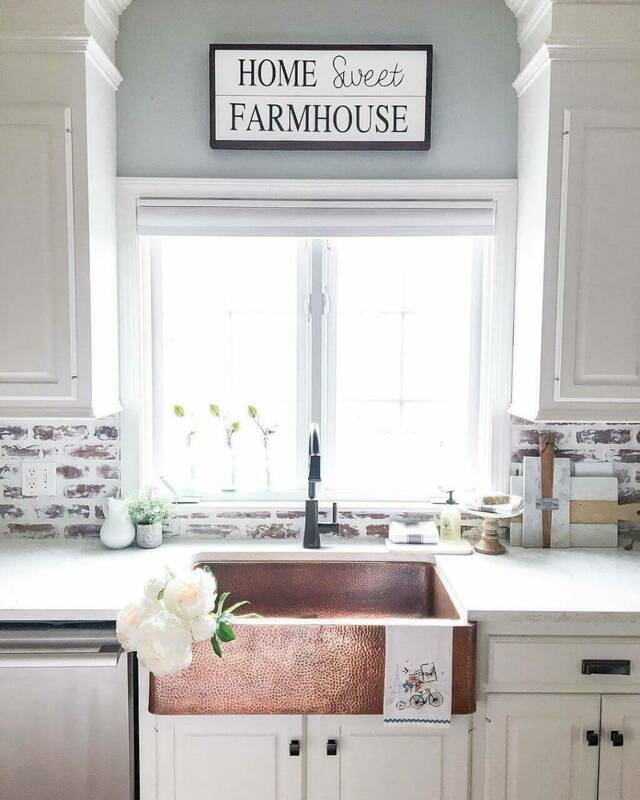 If you already have a neutral tile backsplash in your home, much like this one, it could easily be dressed up with farmhouse décor to create a like-new kitchen. This designer chose bright and fresh lemons to subtly add hints of color throughout the kitchen. Farmhouse kitchens are known for creating a warm, inviting environment. The designer has remedied this problem by drawing the eye downward with dark metal details. 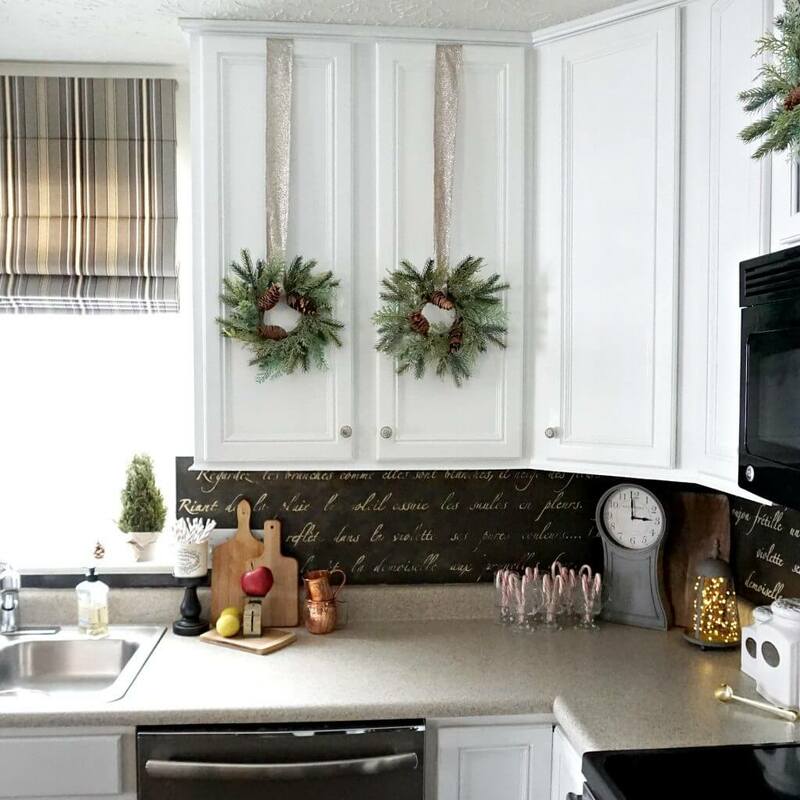 The dark metal in contrast with the white counter to ceiling subway tile backsplash helps keep that welcoming feel. This design incorporates ship-lap in its kitchen a little differently than most and paired it with wooden cabinets and a dark green counter-top. 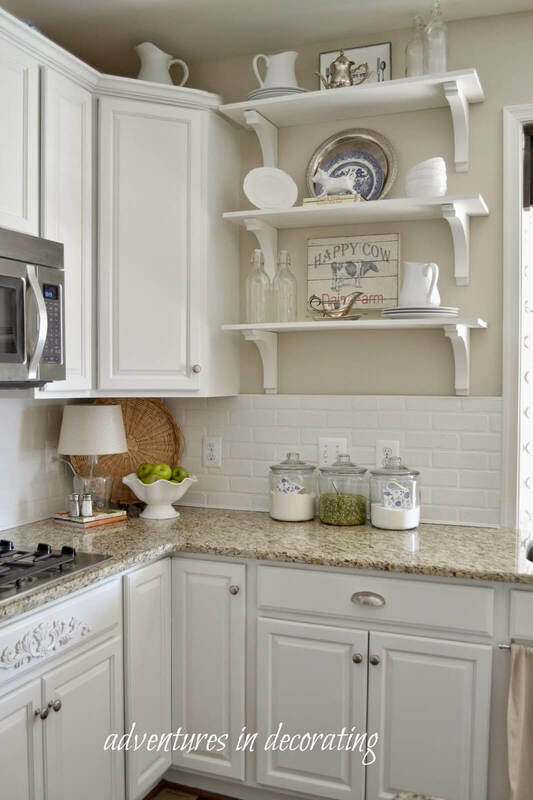 If you are looking for a to incorporate ship-lap into your design, this should be added to your farmhouse kitchen backsplash ideas. 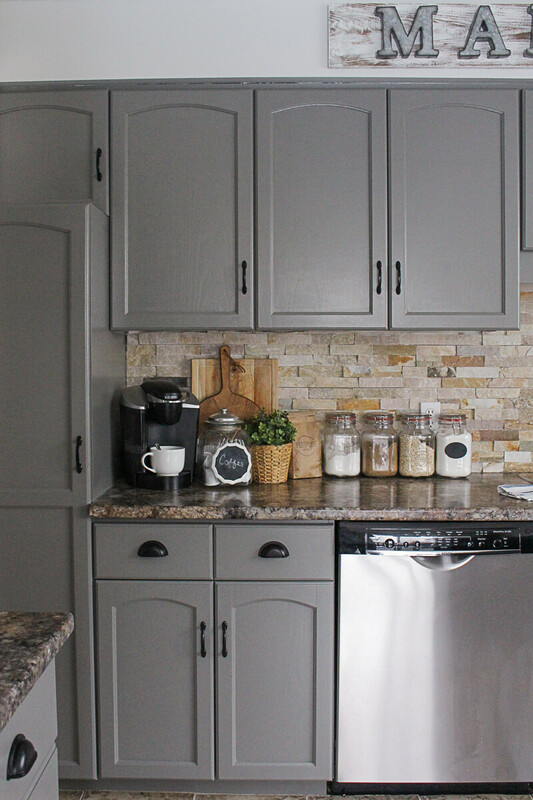 These dark grey cabinets create a dramatic effect paired with the neutral tones from the stone backsplash. The colors are complemented by the glass dry goods jars placed meticulously on the countertop and paired with the wooden and wicker accents.